Cut MP3 files without losing the quality and without having to decode that files. 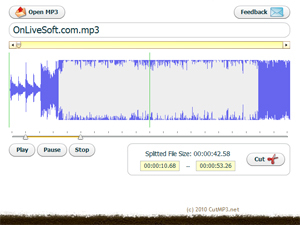 CutMP3.net is a web-based tool designed for cutting MP3 files without losing the quality and without having to decode that files. The way to use the application is very simple: select MP3 file for cutting, set cutting frame and save the result. You don't need to upload files to the application server, all operations are performed locally on the user's computer.